If you live in the Southeast, you may have had the privilege in the last few weeks of spotting a graceful black and white raptor soaring over the treetops. They are starting to settle in to nesting territories and court with display flights. They clutch snakes, anoles, or Spanish moss to attract the right mate to the right tree in the right nesting stand – all to do their best to advance their genes into the next generation of Swallow-tailed Kites. The kites have come a long way, most of them 5,000 miles or more, and some are yet to arrive, but they all are running “on time”. These are things we wouldn’t know without the fantastic tools of satellite and GSM technology, from which we are learning so much about migration timing, routes, roost sites, and habits. We need all this information to conserve this spectacular species. 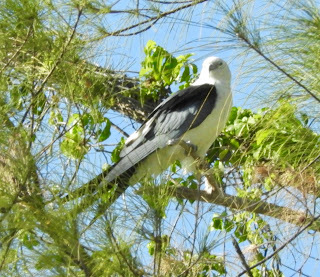 Here we’ll feature the return of two of Florida’s Swallow-tailed Kites, Babcock and MIA, to their breeding territories after they crossed the often-deadly Gulf of Mexico. Babcock started north in mid-January. After a 2-week stopover in Amazonas, Brazil, she stuck to a rapid pace through South and Central America. In Honduras she took a short cut, one we see many kites take, across the Gulf of Honduras to northern Belize. After a brief over-night on the Yucatán, Babcock caught a tailwind on the morning of 7 March that enabled her to reach land at Cape Sable, Florida, after 36 hours. She spent a night in the Picayune Strand State Forest near Naples, Florida, then returned to her breeding territory in Charlotte County by 9 March. MIA perches in a pine. Photo by Alice Horst 2018. MIA wintered close to Babcock, in Mato Grosso do Sul, Brazil. They departed their winter ranges within a day of each other, although over 160 miles apart at that point. They took a very similar route northward and were at one time within 3 miles of each other. We’ve had a lag in MIA’s data across the Gulf of Mexico, but have learned from some of our great supporters that he was, in fact, back on his former territory by 8 March. He has been photographed courting and nest building once again. No time wasted!